From the fireworks at a Kansas City Chiefs football game to improved mineral mining practices, the discoveries made through research at the Experimental Mine at Missouri S&T have changed the world around us. These days, S&T researchers are helping solve human problems such as finding better treatment for military personnel injured by explosives and improved drug delivery in the body. Missouri S&T is the only university in the U.S. with an open-air model for studying blast-induced traumatic brain injuries, and that allows researchers to mimic battlefield conditions. As part of a federal Department of Defense grant, Catherine Johnson, assistant professor of explosives engineering (pictured at left), and her research team are investigating how exposure to explosives affects the brain. They’re mapping blast waves that reflect off the ground and damage structures in an explosion. Working with Johnson is Barbara Rutter, a Ph.D. candidate in explosives engineering. While in the Marine Corps, Rutter deployed to Afghanistan in 2012 and witnessed firsthand the effects of traumatic brain injuries (TBIs) on her fellow Marines. Now she studies the relationship between physical building damage and TBI occurrence so that the military can more easily determine if a TBI was sustained after an improvised explosive device (IED) has exploded. A partnership with the University of Missouri-Columbia School of Medicine allows researchers to use the blast model to better understand behavioral and neuropathological changes to people with blast-induced TBIs. Johnson says the ultimate goal of the research is to eventually improve the quality of life for anyone with a traumatic brain injury, from athletes to car crash victims. Johnson is also working with S&T chemists and ceramic engineers on research aimed at understanding how nanomaterials are made with explosives and creating new kinds of nanomaterials for practical applications, such as silicon carbide for more durable brakes in cars and better bullet-proof vests. She says S&T’s small campus allows such full-circle collaborations to occur. For many years, scientists have known that they can create nanodiamonds using explosives with a low oxygen balance, which allows for extra carbon in the mix. That extra carbon allows the nanodiamonds to form. S&T researchers are trying to understand at what phase the nanodiamond is formed to better understand the process. In fact, Missouri S&T is the only U.S. institution that can make detonation nanodiamonds. Researchers also want to create new, beneficial nanomaterials through detonation synthesis. Nanomaterials have high surface areas, which means they can more easily bond with other molecules and move through the body for better drug delivery, for example. Nanomaterials can be cladded or attached to other materials to make them harder or more heat resistant or help them hold heat better. Johnson’s team makes its own charges doped with chemicals, detonates them and sends the collected materials to chemistry and ceramic engineering colleagues on campus for further analysis. 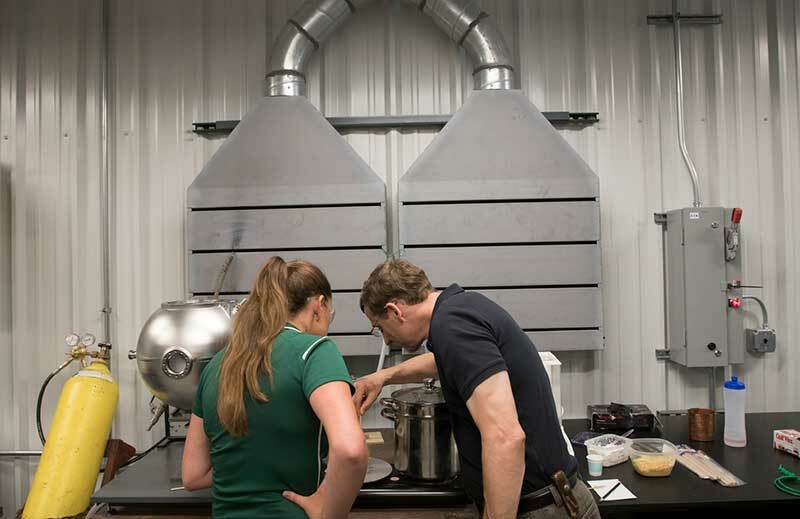 (Above) Catherine Johnson (left) and Bill Fahrenholtz, Curators’ Distinguished Professor of ceramic engineering, work together in the Energetics Laboratory. 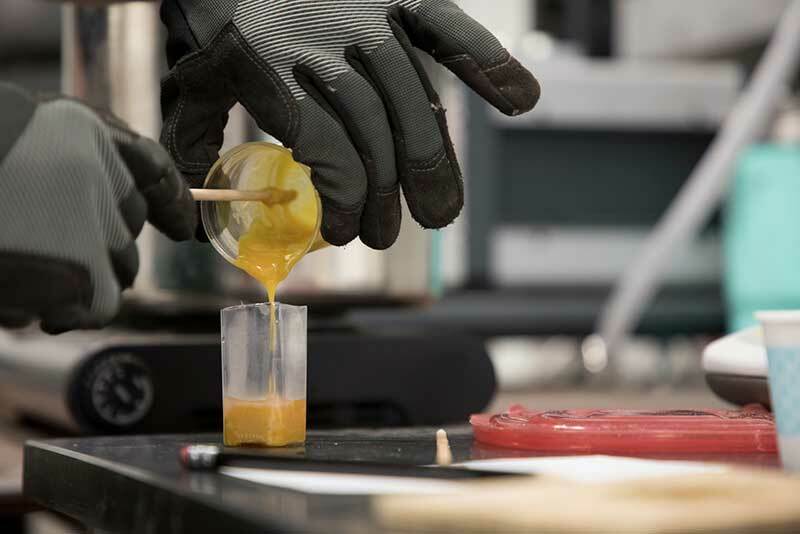 (Left) The researchers are modifying explosive compositions to maximize their nanomaterial yield and achieve first synthesis of nano-sized alpha variant silicon carbide, which has properties that are critical to the ceramics industry.